The 2" outside strap and durable buckle ensure a secure grip. Padded neoprene wrist strap allow you to hold onto much heavier weights and get more reps. 4Fitus Sports Hooks are an excellent choice for anybody who is serious about building muscle mass. Customize your fit with the adjustable hook positioning loops. As a result, you get more out of every lift and have a safer experience whenever you hit the gym. 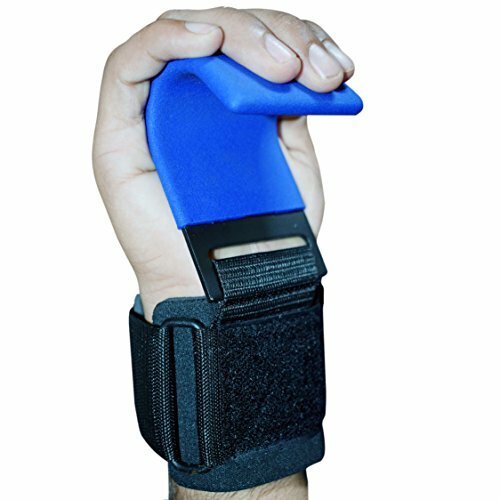 Ideal for powerlifting, deadlifting, using workout equipment and completing WODs training, the Grip Power Pads Pro Lifting Hooks for Men and Women are designed to eliminate the annoyances that other lifting hooks cause. When you choose our hooks, there will be nothing to distract you from giving every rep your all. Our Lifting Hooks are perfectly designed with a deluxe neoprene wrist support for lat pull-downs, shrugs, pull-ups, low rows and other back and shoulder exercises to offer a secure fit for anyone looking to enhance their muscle building routines with proper form and better leverage. A slip-resistant coating, outside strap, and durable buckle ensure a secure grip. If you have any questions about this product by 4fitus, contact us by completing and submitting the form below. If you are looking for a specif part number, please include it with your message.